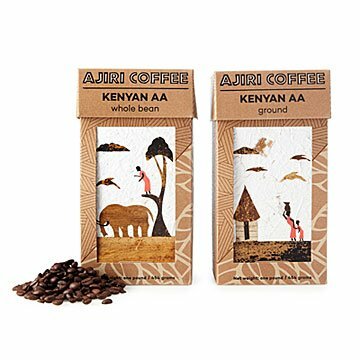 Sip this bold coffee that helps support women artisans and school children in Kenya. Grown on a small farm in the Kisii region of Kenya, this coffee has rich burgundy undertones and citrus notes, but the makers are doing much more than bringing blissful sips to people across the world. They also help women artisans and orphaned school children in Kisii by putting one-of-a-kind artwork on their packaging and sending the proceeds to schools. Each bold bag of beans has a removable piece of the women's art, made using dried bark from banana trees. When you brew a cup, and admire your unique artwork, you'll know that underprivileged children have more supplies, books, and uniforms. Made in Kenya. For what you get, it actually seems under priced. The coffee is very good, and it isn't even that much more expensive than other 1-lb bags of coffee. The hand made picture is definitely a nice touch, and it feels better supporting smaller coffee producers rather than coffee conglomerates. The coffee seems more like a light roast - it's more 'easy drinking', rather than rich. It was a gift to my son in law. He loves coffee. Haven't heard if he likes it yet or used it. We all loved the picture and they were excited about the fact that it will be helping someone else by buying the product. Lovely works great with your coffee grinder too! Grab Bag Gift for the WIN! I bought this for a grab bag gift and my Aunt was the lucky recipient. She told me today how wonderful the coffee is!!! I may have to purchase some for myself too!! I always struggle with what to give my brother, who is a minimalist and never wants anything. He also tends to purchase himself items that he wants, so gift-giving is a struggle! This was perfect for him, though. A consumable item that helps people in need. This product was a gift for my mom. I haven't given it to her yet, but the boxes are beautiful. I look forward to her opening it. The coffee is fantastic, the artwork on the bag is beautiful. The whole thing is a fabulous gift that helps a community. This is my third purchase of this coffee. I had learned to love African pea berry coffee @ a local coffee shop. After that shop closed, I had been searching the internet for a similar coffee bean for quite some time when I received this coffee as a gift. I love it's flavor and the artwork as well. I happened to buy this coffee in a fair trade store while visiting Tulsa. It was a good choice. The coffee is smooth and delicious. The art work lovely. It is a little pricey but worth it. Even the box is beautiful. I am happy to see it here, because now I have a place to purchase it from home.